An afternoon on the 50, going in circles on Dixie Highway. We're downtown waiting to pull out for another trip north out of Central Terminal. This time of day things are busy and chaotic, crowds waiting to board and get home. It takes some doing to get noticed in the frenzy around us; Ernest does it without breaking a sweat. Relentlessly sociable and forcefully excited, he's a young man with big dreams who has a way of cutting through the fray. On a different day, he'd plainly announced, "There's no other guy like me in the world." The figure he cut decked out in leather work boots, light denim pants, untucked fuchsia long-sleeve button-down, and loose green tie with a cross embroidered on it kept him true to his word in one sense. At the time he was getting me up to date on his business plans to be a powerhouse sports agent, representing NBA players. This day was new, and fashion wasn't a sticking point. We pulled out of the terminal and he pulled up front, a moving figure in my peripheral vision. It was that calm time after everyone's aboard and we're moving. 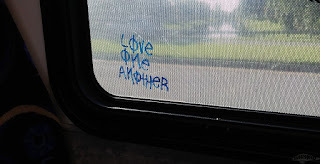 Things can get quiet in the bus space, punctuated occasionally by outside sounds and ambient conversations. The anxious rider to my right showed up at the right time. "Hey there! Another exciting day?" It was my simple invitation for him to share, and he was ready. "Yeah, today I was in court learning from Wayne Huizenga, Jr. The best business man on the planet." "That's interesting. What's he up to?" A brief pause to reflect, then: "Simply living life to the fullest." "That's not always so simple. What's the secret?" Without hesitation, and succinctly: "God." At this point we were in a long line at a red light, not going anywhere soon. He had no intention of waiting needlessly, so when the doors opened, he bounded off. As quickly as he'd expressed himself, just as quickly was he gone. While we sat immobile, suddenly he was several blocks ahead of us, carried by some internal energy encouraging him onward. Morning light is the day's way of waking up, a quiet fury of heat. My Sundays on the 34 along Sample Road often included a section where our rising star directed its rays through the window at just the right angle to bake my stomach and lap, and turn the streets into gold in the shadow of Mt. Trashmore. The momentary disruption reminds us that light is a tangible yet untouchable visitor, visiting only when our directions align. A previous post provided an example of the direction-challenged youth of west Broward. It's probably a generalization and grossly off the mark, though they sure do make it easy to reach conclusions. So when one particular regular rider boarded, a young man always with book in hand, and that book happened to be titled Let's Get Lost, maybe it's time to ask myself if I'm reading too much into the signs. Every Sunday after servicing the Tri-Rail train station, we'd turn back onto Sample Road for a westbound trip into Coral Springs. There he'd be, not standing by the bus stop sign or plopped on the bench, but down on the sidewalk, cross-legged, face focused on the book of the moment. He'd board and be polite to a fault, which makes an impression after countless blasé interactions. We'd make small talk about the book and life before he bounded off at his exit - with a Good Day and a waving smile. Light goes in all directions, not necessarily our own. And it doesn't get lost, it shows the way. 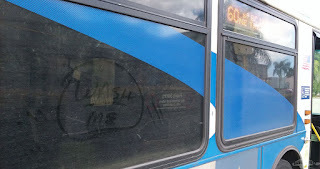 Occasionally on some routes that primarily travel through nicer parts of town a passenger will feel compelled to come over to me and denigrate other routes which service our more low-rent districts. When this happens I get a little confused and am unsure what they are trying to say; maybe it's because my experiences on those 'lesser' routes among the ruins has proven that's where Life is most evident. One morning on the first piece of a 10/50 split I finished the run and while doing a post-trip walk-through, found a seat covered with broken glass, drug baggies, an unusual cutting blade, and other paraphernalia. Scary stuff to imagine a kid getting their hands on, and a sobering reminder of the darker desires of human nature. Now the 10 runs up and down Federal Highway, a major commercial corridor lined with every service and diversion known to man, generally well-kept and rapidly gentrifying in more established sections. Yet here, where the sun shines a little brighter and the palm trees grow taller, someone's inner misery compelled them to accumulate a "tool kit" to work on a slow death while their heart still beats. A few hours later and my own heart was still heavy when the second piece on the 50 began. This is the forgotten part of Broward County, large swaths of the built environment stuck in a different era with little sign of any significant upgrades. Hookers are strutting in the usual spots, displaying slight variations in their uniforms of heels, short skirts, and tube tops designed to attract dusty day laborers with cash in hand and seeking affection. Pineview Cemetery up at the north end of the route in Deerfield Beach seemed a fitting symbol of the state of humanity this day, so many spent bodies lined up in resignation. I'm not familiar with the cemetery's history, though the crumbling and illegible markers indicate this place has been here awhile, perhaps even older than the city itself. Images of generations of farmers, pickers, and packers naturally rise from the ground here, lives hard-worn in pursuit of survival during simpler times. A lone bus stop is also planted in the middle of the cemetery, an outpost of Life among the rows of buried dust. As we turned onto 4th Street toward the empty stop, several young guys from the nearby automotive school were racing across the street to catch the bus. They're usually arriving there as we pull in, but today it appears they were delayed. Pulling up a little short of the stop to save them some steps, and deferential to a tilting gravestone mere inches from the street, I lowered the bus in welcome. One loads his bike on the rack, creatively painted at the auto shop in red and metallic gold. Another parks himself in a backseat, playing some instrumental hip hop on his device, rapping along smoothly enough to show promise in his skills. These kids haven't given up, their joyous expressions of life radiating in the midst of the graveyard. At first blush he had a sort of stoner look: 20-something dude in baggy zipper sweatshirt with fashion print, untended facial fuzz, residual pot aroma. His very animated and talky mood may have been natural, or perhaps enhanced by outside stimulation. Generally, it was more of a nervous energy, borne of excitement and possibility. He was on his way to the casino, with $40 and a dream. Poker was his game, and as he described his winning - and losing - hands in a vocabulary with which I'm not entirely familiar, I got the impression a lot was riding on this venture. Gaming for some may be an act of leisurely entertainment; for this young man admiring the techniques of old-timer card sharks and wishing to join their ranks, this was developing into a full-time pursuit. "It's called the 'Sino, not Casino. If you lose, it's the 'No." Oftentimes when I hear the word No come up in a dejected context, a dear friend's encouragement comes to mind. She learned it from her mother and it traveled many miles with her to eventually be a blessing for me as well. "You already have the No. Go get the Yes." A simple line, and gently motivating. Of course there are similar quotes we hear from time to time, but that day I shared this one with him. Life itself is a game of chance, ultimately immune to our constructs of systems and goals. Perhaps even those things arise from our innate desire to improve our lot, win once in a while, and sometimes get the yes. Our commuter express routes are utterly unlike our local routes. The buses are different, the places served are different, the number of stops is different, the roads used are different, and - as many drivers will attest - the passengers are different. There is a general impression that the folks who use these routes are more demanding of quality service and have higher expectations in return for their higher fare. After all, many are professionals who work in Miami's centers of health and banking. Premium people using a premium service you might hear. With all those differences it is tempting to think of our premium passengers as being polar opposites from our local route regulars (e.g., Cold/Warm, White collar/Blue collar, Highly educated/Poorly educated). So on a day when I had a trainee in my charge, Life boarded the bus and taught me a lesson, reminding me those differences are an illusion. We had deadheaded to downtown Miami for our afternoon tripper back north to Miramar. On SE 1st St a construction worker boarded replete in safety vest and hard hat. This had to be a mistake, surely he wanted a local Miami bus and accidentally boarded ours. 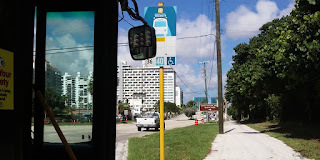 First he tapped his Miami-Dade Transit pass against the farebox. This only enforced my assumption, since our bus was clearly marked Broward Transit - plus our fareboxes don't work that way. With the trainee taking over the driving duties, I had it easy directing passengers as they boarded the rapidly filling coach. The confused man was persistent so I determined where he was trying to go and sure enough our route was going near his destination in west Broward. Weary from a long day on some dusty construction site, he stuck out like a sore thumb among the sharp-dressed riders, a picture of vulnerability just trying to get home. He gave us his story of his car breaking down and being forced to take transit from Pembroke Pines to Kendall, at least a 30 mile journey. He may have first appeared to be poor at planning trips, but now it was obviously simple unfamiliarity with the transit system. Since his bus pass wouldn't work for this trip, he reached in his pockets in search of bus fare. Empty. At this moment, the premium/local divide was about to blur. "I have an extra trip," a passenger offered, then got up and swiped her pass for him. This wasn't a monthly pass, but a 10-trip one so it wasn't actually an extra trip, but one she would have used the next day. Another passenger then gave her welcome: "We know you're new, so we'll look out for you. 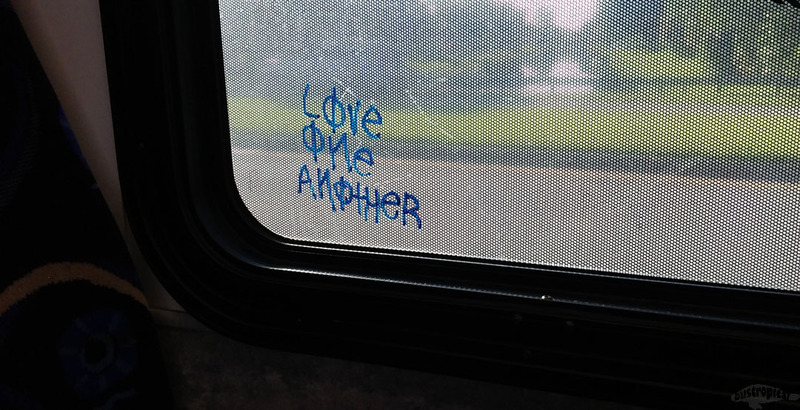 On the bus we're family." Yet another passenger voiced agreement and suddenly this was a bus of truly premium people. After that incident of selflessness, a side note of selfish self-promotion. I was selected Operator of the Month at the Copans garage for December 2016. I like to joke that the criteria may need to be revisited if they're picking weirdos like me, but I am thankful for the honor and hope it means I'm doing something right. "Do you go to Sample?" The question from this 20-something guy sounded routine enough at first. And the obvious answer was Yes, since this bus was the 34 and spends all day going east and west on Sample Road. This type of question pops up on every route occasionally, from US 1 to 441 and beyond. We all make similar mistakes every day, so I don't make fun of these slips, but I do have fun with them. "We sure do go to Sample! You're already here!" Then the realization comes, and we can figure out where on Sample he's trying to go. "Going to US 1?" His second question immediately replaced my attempt at jest with sympathy. We were headed west and his destination was east. He needed the bus on the other side of the street, and it was passing by as we spoke. This wouldn't be an issue on a weekday, but today was Sunday and the next 34 wouldn't be by for awhile. Fortunately, it appeared to be servicing a stop, so I pointed it out and off he went, shuffling across the street in flip flops. "No sense of direction." The observation came from another, older passenger who'd been watching. His comment assured me I was not the only one with a theory on suburban kids. There are generations of west Broward young people who are so far west they may have never smelled salty ocean air. Even though I'm a born-and-raised Eastsider, I personally disdain the beach because it's too sandy. Even so, the Atlantic is my first point of reference for direction. It is always due east, and with our generally north-south-east-west street grid there's no need for a compass to determine which way to turn. What reference point does someone in Coral Springs use to get their bearings? 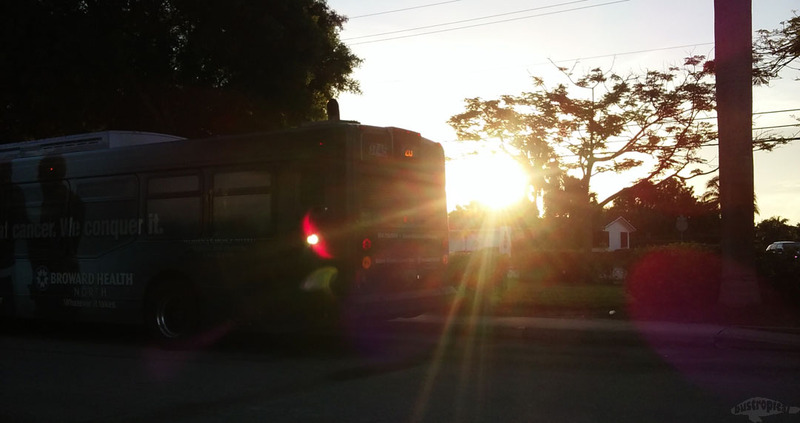 He boarded somewhere in Coral Springs, the land of manicured lawns and so many trees they hide the bus stops. An older gentleman, hunched from the years, with a dark, full goatee. A curious accent behind his fluent English tweaked my ear. Bus space is magic, it makes it possible for the whole world to come in those doors and be at ease. Very quickly I learned he would be going to Afghanistan for several months. "I was born there, but I'll die here." A depressing comment on the face of it, but actually just a matter-of-fact statement. He then transitioned into talking about the house he built here for his growing family, those children now grown. 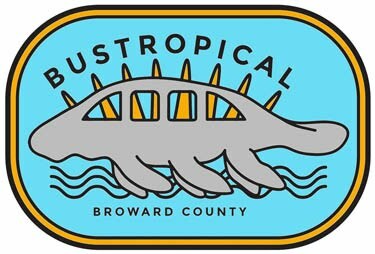 A journey begun many years before in a distant land had led him to Broward County, making us neighbors. I asked him to send a postcard. An afternoon on the 50, eight of us drivers forced to stop before we can start. There doesn't seem to be a taxi available for us to get downtown to Central Terminal and start our shifts. There's a substantial crowd waiting when I finally arrive, hop in the seat, and book it. We're down 11 minutes, but we're gonna keep it moving and get on up the street. Great intentions, but today we have one of the slowest buses in the fleet. One with a single large spaceship door, which is also slow itself and confounds passengers accustomed to the standard double doors. These models are designed for commuter routes, so they can zip along highways just fine, but seem to struggle on local routes. At Sunrise we pick up Mr. Mercedes like usual. He's something of a master painter and has repainted his bike since the last time. Now it is a glossy bright green, and still decked out with Mercedes hood ornaments on the front and rear splash guards. Shortly into the trip he comes back up and shows me picture online he finds funny. Thanks for the laughs! The onboard computer isn't accepting my login today, so it won't be announcing stops. Maybe it's just me, but I love these glitches. It gives me a chance to go old school and announce stops the way drivers used to, with my bus voice. Plus I can call out stops the announcer might miss. Another shortcoming on this bus only sweetens the experience: the PA works and has a stellar retro machine sound effect, like blown speakers in a old European train station. Now this is fun, and I don't miss an opportunity to make an announcement. At 48th St in Pompano, just at the end where line crews had the right lane closed, there's a fender bender in the left lane. Traffic is backing up and impatient motorists are cutting through the orange cones to get around the blockage. A passenger offers to jump out and move some cones. Thanking him for the gesture, but looking out for his safety with traffic so close, I shift a couple cones myself so we can bypass the crash scene. The line crews are gone anyway. "Stop here!" A young man up front forgot to signal his stop and we passed it. Another young man chimed in with some advice: "Ya gotta ring the dinger, yo!" On Wilton Drive a woman smiles with her gold grill. Almost equally golden are her stunning 3-foot-long semi-bleached super-thin dreads resembling the roots of a sabal palm. Over at McNab Rd, a regular with a manbun is puffing a newly-lit cigarette. "Sorry to cut ya short, man." I sympathized after he tossed the one-drag smoke. "No worries. That seems to be how I summon you guys." Up on Hillsboro another 50 bus sits broken down. He has no passengers to transfer so it's not our leader bus and has probably been there awhile. A beautiful thing about the service improvements to the 50 is the extra recovery time at each end. One consequence however, is we arrive at the Central Terminal before our leader bus has vacated the bus bay. When that happens, we park in D aisle until the space is open. This day my follower arrived earlier than anticipated and took the assigned spot before I could. This meant loading everyone while parallel to that bus. We weren't at the curb so I lowered the kneeler to make it easier for passengers to board. Yet another feature of this bus is a temperamental kneeler that must be operated a certain way. If operated like most buses, it will freeze up and not forgive you. Sure enough, that's what happened until one of our finest mechanics came over to assist and get us on our way. Bright Sunday morning. At a red light, a woman is crossing the street in front of us. Graying yet trim in form-fitting jeans and sunny yellow blouse, she gestures toward me, mouthing unknown words. Traffic isn't moving, but I popped the door anyway to get her out of the street. "Do you happen to have an extra pass? I'm in the ministry for the return of Jesus Christ." Sympathetic to her request, and realizing it was time to move the bus, I offered her a ride with us. Pensively rubbing her chin and gazing eastward, she accepted the offer. "I don't know where I'm going, but I'll take the ride. God bless you." A few miles later she exited at a stop that wouldn't be serviced the rest of my shift, a rarely used stop even on weekdays, with no obvious reason a person might want to get off there. "Thanks again. Are you a Christian? My daughter and I are living by faith." There was nothing aggressive in her tone or even necessarily prying as she didn't wait for my reply. "Hang in there." I encouraged her while effectively ending the interaction. "It's a good thing." Her closing words were an affirmation she had seen something she could not deny. Miles from our west end layover, on our next trip in the same direction, a man in his early 30s boarded. "You have something in your hair." At first I thought he was complimenting my hairstyle, so he repeated it and I reached up expecting to find a piece of lint or similar lightweight debris. It was a five inch long yellow stem, presumably a cast off from a shade tree I utilized at the layover. I was mildly disturbed by two things: being completely oblivious to such a sizable foreign object on my head, and also that no one boarding prior to this fellow had mentioned it. It's size and color prevented it from hiding in my hair and was actually sitting right on top. Plus I greet everyone who boards my bus, so it's impossible everyone could have missed it. Sometimes we see things no one else does, and need to tell everyone. Other times we see things everyone else sees, and want to say nothing.